It is clear why the WebSummit crew chose Lisbon as a location to unite people from all over the world.Five centuries ago Lisbon was the capital of the world and is still a meeting point for all nationalities and cultures. As António Costa, the Prime Minister of Portugal said Lisbon should be the place to inspire people for making a better world. Lisbon, the capital of Portugal, experiences a big boom which you can feel and see everywhere - modernization, constructions all over the city. Many companies decide to move to Lisbon as it is the perfect time to take the chance of the big boom the city goes through. The capital as well as Portugal became an open minded society, where change, and innovation find a good base for development. This year’s WebSummit had more than 60,000 visitors, 1,200 speakers and more than 170 countries attending the conference. 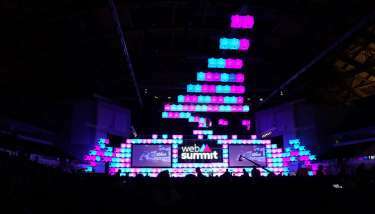 To attend the WebSummit for the first time was an overwhelming experience. The venue is huge and has a lot of offers. So you have no idea where to start and stop. One thing is clear it is impossible to see everything, even everything you chose to see. But no worries, you can find many talks later online at the WebSummit Youtube Channel. The first learning from the conference: Do not stress to see everything. Go with the flow, enjoy the great setting and the people around you. Have a look on all the offered topics you are interested in and talk to people, who inspire you. It is a great chance to meet like minded people and to connect with folks from all over the world. There were important and interesting talks concerning the future of our industry. Topics like AR, VR, AI, Machine Learning, Big Data, Chatbots, The Future of Communication held by big players as aws, Google, Slack, BMW, Amazon, IBM and many more. One key learning of the talks is the importance of using all the technical tools we have nowadays to add value for humanity while never forgetting the hidden dangers behind the broad scope of today’s technologies. In “Getting Product Strategy Right” by Des Traynor, Co-Founder of Intercom gives us a valuable lesson: Define problems and the connected solution without tying it to temporary technological tools. This is the key for a successful product strategy. In a fast moving world which we live in, used technologies can change from one day to the other. Moreover many start ups had their chance to pitch and show their products and receive feedback on them as well as to find potential investors for their ideas. They made clear how important it is to be passionate and ambitious as well as concerned about the solution for the problem to create a strong product. After walking 82,000 steps, round about 50 km, shaking more than 60 different hands, meeting people from more than 20 nations we can say we are impressed by what the WebSummit creates: Connecting people from all over the world, who are eager to focus on the opportunities which new technologies make possible nowadays. To create value for yourself of the WebSummit visit you have to prepare yourself well. Study the schedules and speaker lists in detail. Use the app to connect to people, find talks, and structurize your stay. The app and the website are on a good path but improvements could be beneficial concerning more transparency and structure to reduce the confusion about the available program and locations. All in all the WebSummit is an unique experience for everyone who is interested in tech, innovation and the future (of work). Many inspiring people come to this impressing place in Portugal, who learn how to use technology to create value for humanity.